If you think the man in this picture is a milkman, you’re wrong. Sort of. The Germans had just lost the Battle of Britain, one of the first big hits to Hitler’s strategy. So essentially, Hitler had a tantrum and tried to turn London into hell. Beginning in September of 1940, German forces launched an attack on Great Britain, specifically London, dropping bombs left and right. This attack became known as The Blitz, and it lasted from that September to May of the next year. 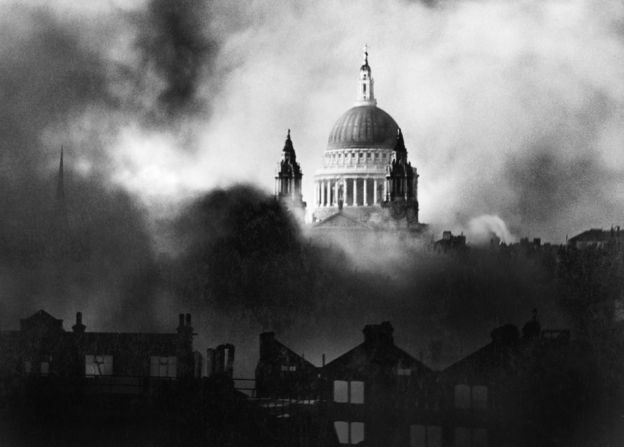 Day and night, German pilots dropped bombs on cities like London with the intention of demoralizing Britain and forcing them to fold as a significant power in WWII. At first, the British government tried to convey an air of indifference and strength – similar to the way an older brother will ignore a younger brother who keeps poking him. They wanted to seem as though life was continuing as normal, and even an American film “London can take it” advertised the idea that “bombs can only kill people, they cannot destroy the indomitable spirit of a nation.” In reality, Londoners were leaving their homes at night (when most of the raids occurred) and hiding in parks or even subway tunnels that the government had (unsuccessfully) roped off. “By 4:00 p.m. all the platforms and passage space of the underground station are staked out, chiefly with blankets folded in long strips laid against the wall – for the trains are still running and the platforms in use. A woman or child guards places for about six people. When the evening comes the rest of the family crowd in,” reported an unknown eye-witness. Night raids consisted of initial incendiary bombs dropped to light the target for the second round of highly explosive bombs. Generally, the Underground was considered a safe place. But they weren’t a 100% guarantee. On one unfortunate night, a German bomb dropped through the road and fell into the station, killing 200. 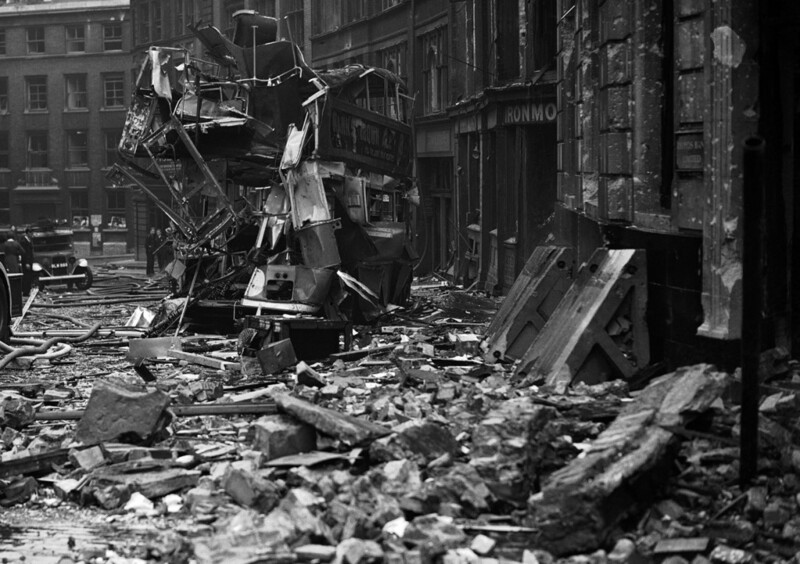 By the end of the Blitz, 30,000 Londoners were dead, and another 50,000 were injured. Despite the British government’s best efforts, morale was low throughout those several months. The government did everything they could to censor images of destruction, but they couldn’t keep people from looking outside. But on October 9, 32 days into the Blitz, Fred Morley had an idea. As a photographer, he was very aware of the power of images, and he personally felt the world should see the devastation in London. But he knew the British government would never allow a publication of an image that was just of bombed streets and burned buildings. So Morley and his assistant set out to find the right backdrop for their project. That’s right – this photo was staged. Morley walked around the rubble of London until he found a group of firefighters trying to put out a fire amidst the fallen buildings, as he wanted that specific scene in the background. Here’s where the story has some variations. Apparently, Morley borrowed a milkman’s outfit and crate of bottles. He then either posed as the milkman or had his assistant pose as the milkman. (There’s only one other well-known picture of Morley… we think. It’s generally thought that the man in the photo is his assistant, but it’s possible that the man is actually Morley since we don’t know what Morley looked like. There’s also a question of why Morley didn’t just use an actual milkman in the photo. 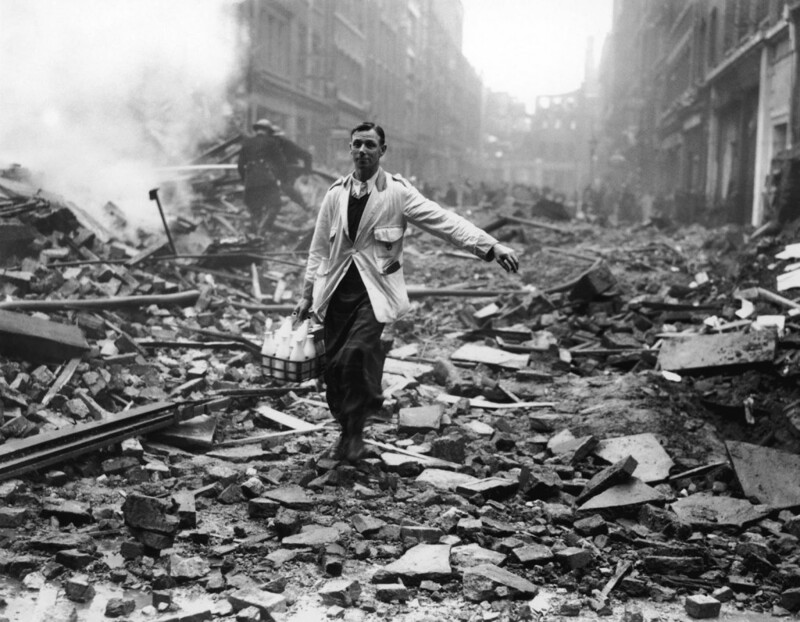 Most likely, there weren’t really milkmen walking the streets of London, making deliveries to families who had just lost their homes or loved ones. But it begs the question: where did he get the milkman outfit if there wasn’t an actual milkman out and about?) Setting the scene with the firefighters in the background, Morley hoped to convey a sense of “keep calm and carry on” in the photograph, and he presented the image to the press as soon as he could. The British government’s censors felt that Morley’s photo accurately depicted normalcy in London following a raid the night before, and they published the image the very next day. They thought it would boost morale, but they also thought it would send a message to Germany that Britain was still holding strong despite the Blitz. 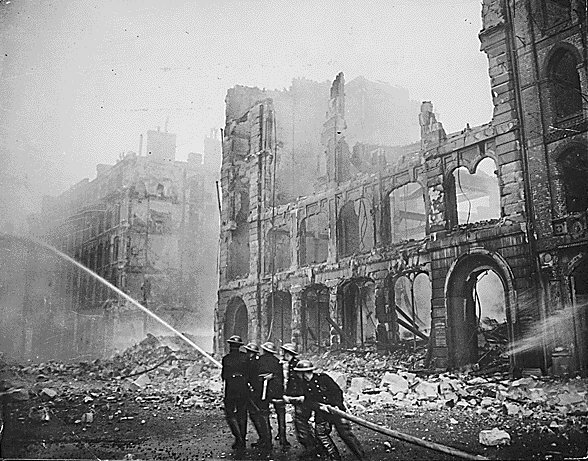 Indeed, Britain’s air of resilience was frustrating to German forces, and though the Blitz lasted for months after Morley’s photo was published, the Blitz is still considered by many to be a failure on the part of the Germans as it did not accomplish its mission of demoralizing the English and removing Britain from the war. I for one, would be perfectly fine with a redundant post about WWII, being the big history buff that I am. Also, I think all of these photos hold great power and clearly have affected the way we view the conflict today. I for one, did not know the origin of the “Keep Calm and ____” posts that I always see on social media. My favorite though is “Keep Calm and Keep Running”:). Well done yet again, it always astounds me how you find out so much about these photographs. This pictures were truly astounding. I admire the valiant efforts of these photographers for whom you obviously feel a lot of respect. Thank you for sharing these WWII icons. I read this while Jessica discussed admissions into Schreyer’s, so I may have missed stuff, but bear with me. Seriously, I don’t have enough time to comment as it is, I’m gonna have to do even more of these in my free time now. Anyways, WHAT? NOT A MILKMAN? Why couldn’t you just let me live in peace, and believe in the illusion. Ignorance is bliss, Hannah. Also the picture of St. Paul’s certainly deserves it’s own blog post, although you’re right, it would be rather redundant. Oh well.